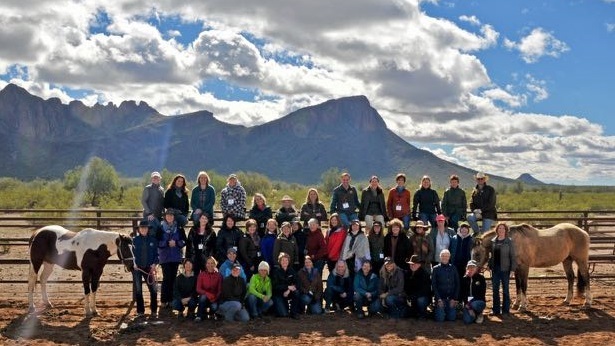 For 10 years Kathy Pike pondered hosting a gathering where the true nature of Horse could be honored and respected through a collective of leaders in the field. This is our fourth gathering of like-minded individuals who are ready to explore and expand consciousness through interacting with horses. Join us for the . . . Arrive by to the White Stallion Ranch between 1:00 and 3:00 on Sunday, January 27, 2019. Opening reception and selection of your sessions is at from 4:00 to 5:00. Conference opening presentation by with Kathy at begins at 5:00.
and meditation process to build community space. Enjoy Coaching with Horses sessions all day Monday through Wednesday. Depart after 2:00 on Wednesday January 30, 2019. 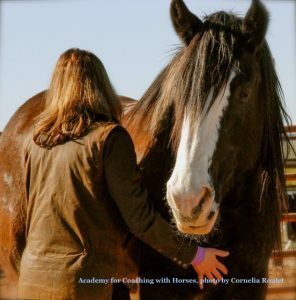 Join international author, teacher, and founder of The Academy for Coaching with Horses, Kathy Pike, along with several other professional Equine Facilitated Learning and Coaching certified practitioners as they share their love of Horse and expertise in a variety of fields related to the emerging practice of Equine Facilitated Learning. Experience the power of Horse to touch and expand one’s heart. Become one with the sacred energy of Horse. 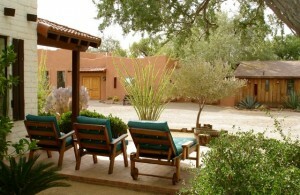 Decompress through yoga, massage, and self-reflection in a serene, retreat-like setting. Ride a horse below the spectacular Rincon Mountain peaks. Experience the beauty of the Arizona landscape. Ask questions and explore the various options in the emerging field of EFLC. What might you gain while you are at this program? This program offers a rare blend of taking time to simply “be” and to grow personally and professionally. 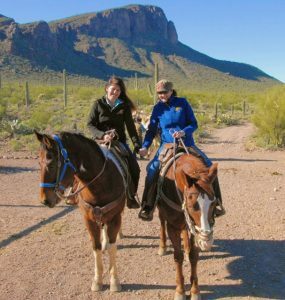 You will enjoy a diverse herd of kind horses, the natural desert setting, warm days and cool nights, yoga, and time to reflect and enjoy the ranch. If you are new to this type of work you will have the opportunity to experience Horse in a way that you may not have previously. What if I am already a professional in this field? 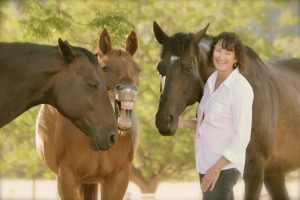 Many individuals who are already certified, or have taken training courses with other teachers in the equine based learning field, attend Kathy’s programs. The deep, body-centered, heart-based approach often facilitated through the use of the Mind Body Method will be reflected in the sessions offered. As a professional in the field, you will have the opportunity to advance your skill set, gather new concepts and ideas to support your work, and meet other professionals in related areas of work. 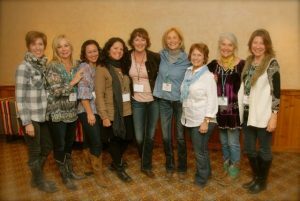 What makes The Coaching with Horses Retreat and Conference different? While many conference events host up to hundreds of people, we have limited attendance to our retreat-styled event to create a very intimate setting of sharing and bonding with others. With only up to 40 participants in attendance, you will have an exclusive opportunity to interact with, ask questions and get to know the horses and the real details behind this work. the insight and knowledge of their specialty within the EFLC world, but will also be sharing an actual experience with you. Due to the limited attendance, several equine-based learning sessions will have only 8 to 10 people and you will personally get to participate in most of these experiences and have a very hands-on and intimate learning session. Each morning and afternoon there will be three to four different breakout sessions to choose from. Some sessions will be offered twice to ensure you can attend those you are attracted to. As a leader in the EFLC community, Kathy had many, many specialists submit applications to present sessions at this Retreat and Conference and the result enabled her to select a distinct variety of presenters each with a very specific specialty within the field. Most of the presenters are previous graduates of The Academy for Coaching with Horses. Each and every one will provide a high quality and insightful experience for you. A perfect way for individuals already offering their own programs to expand their skill set and gather new ideas on facilitating. The Coaching with Horses Conference structure provides you an all-inclusive spiritual retreat setting surrounded by a herd of over 100 horses. A very casual and personal atmosphere allows for continual interaction and facilitates authentic connections between both participants and presenters. Gatherings and activities function as ideal catalysts to encourage friendships and support the spiritual motivation behind the entire event. Your conference experience will be concluding with a very special “Ritual Ride”. 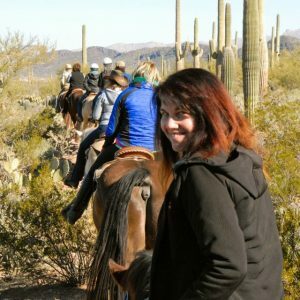 During this ride the group moves through the fragrant and expansive desert in silence and communion with their horse just below the spectacular Rincon Mountains located in the Saguaro National Park. It includes a spiritual ritual below the mountain peaks. A lovely way to end a very special time and set intentions for the future! A matchless experience. Individuals who do not wish to ride may conclude their conference experience with a very special ending ritual session with the horses. This experience will help you to integrate your learning and experiences while honoring horses and Mother Earth. With your values awakened you will set an intention as you embody the energy of your true self and merge back into your every day life. Yes! Please Reserve My Spot Today. The human species is balancing on a precipice of evolutionary change. The ability to connect with higher levels of unified collective social structures that engage in selfless acts of kindness can literally reshape our society. We must move from the unconscious, conditioned, fear-based paradigm in which we currently operate into one that is based on trust, love and the connectivity of all living things. Horses naturally demonstrate these attributes, effortlessly and seamlessly, as it is their nature. 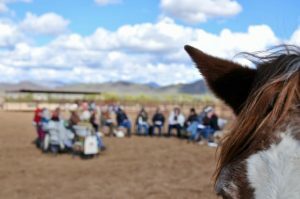 During this conference our human collective will merge with a herd of over one hundred and fifty horses on the ranch. The capacity for unfiltered, present-moment awareness will be intensified as we drop into the herd’s spacious field of consciousness. This emptied state of being leads us into the divine source of wisdom and unique expression that lies within us. Once discovered and engaged, change is not only possible, but inevitable. 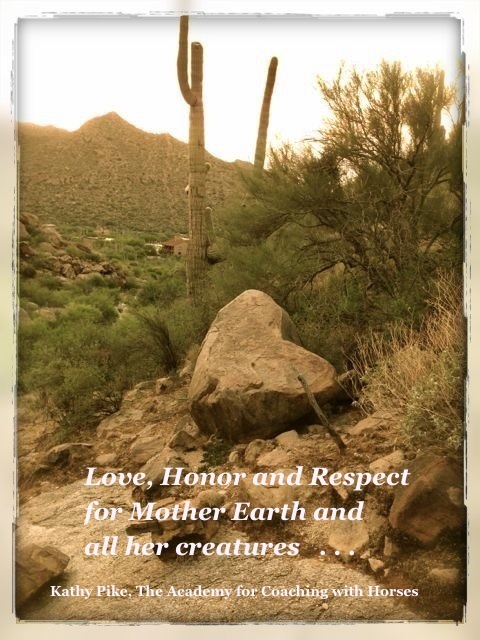 As we evolve we go deeper into service to others – be it humans, horses, or Mother Earth. Join Kathy for this opening night lecture, meditation and communication with the herd that will lay the foundation for the retreat and conference. Energy is Universal. Energy is ever present. Energy is powerful. Horses are fully attuned to energy and vibration – theirs, and yours; it’s natural, instinctual for them. Horses can teach you to sink into the subtle communication possible within the energy field. The Chakra System is a perfect model to learn and explore these possibilities. Every living being has energy centers (or Chakras) that can be balanced and rejuvenated for higher levels of health and vitality. Through hands-on application with horses, you will learn about the origin, purpose, physical location, theme, key beliefs to shift, and bio-energetic activity of the seven Chakras for both Horse and Human. You will gain confidence in sensing the flows of energy and intuitively receiving what is being expressed in those centers. The tools taught here can be used in your personal life, to keep your horse energetically balanced, and blended into your client sessions in EFLC. Discover how the Chakra system, with its deep balancing power, can help you and your horse activate the vital life force both of you need to flourish and enjoy a vibrant life. Anouk Lorie holds a Master of Science in Business Engineering, an MBA in Operations Research and a Degree in Early Childhood Care Centers. She has over 20 years of experience in the High Academic and Corporate worlds. Anouk overcame a serious physical illness, enabling her to dive into the firm intention to live her dreams and have a meaningful life. Born in Belgium, she decided to change everything radically and moved to Canada in 2013. During an equine facilitated session with a horse named Cochise, she reclaimed her life. She works deeply with her energy field to gain vitality, live her dreams, and help people and horses. 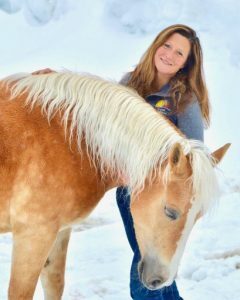 Anouk is a graduate, Advanced Facilitator, Certified Chakra Coach and EFLC Level One Provider and Program Assistant with Kathy Pike and the Academy for Coaching with Horses. She is also the organizer of the Annual Retreat and Conference. Anouk delivers programs in the US, in Europe, and at her facility in Eastern Canada. www.wasabicoaching.com. This hands-on session with Horse is for individuals who are seeking greater clarity about the blocks in their life or work journey. While guiding a horse through various obstacles, you will be presented with opportunities for new ways to see, think and feel about your journey. Your horse becomes an energetic mirror for your deepest doubts, purest desires and quality of your inner dialogue as they sense the absolute essence of your inner landscape. While partnering with Horse, you will gain clearer understanding of non-verbal communication, learn how mindful moments can alter your path, align intention for forward movement, claim an authentic voice to successfully navigate transitions and obtain greater clarity and confidence about “Who am I on this path?” and “How do I represent the ‘real me’?” You become more authentic through the soft, clear, unfiltered guidance of Horse. Kay Anderson’s career has taken her from the playgrounds of early childhood education to the world of women’s colleges, from corporate boardrooms to developing her leadership development organization. Her work is now in the open-air buildings of overnight summer camp. The common thread is her passionate pursuit of lifting others in their quest to discover their own expansive, extraordinary potential. Kay earned her Master’s Degree in Organizational Dynamics and Leadership Development from the University of Pennsylvania. During a ten-year association with ARAMARK, she worked as a staffing expert and human resources director. She was the founder of The HumanSide, LLC, which provided leadership development to organizations and individuals. 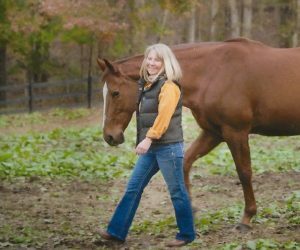 Kay serves as owner and director of Skyland Equine, which offers life coaching and equine experiential learning programs. She is co-owner of Skyland Retreat and serves on the board of Skyland Camp for Girls. Based near Asheville, North Carolina, Kay is a graduate of the Academy for Coaching with Horses (2014). During this program, you will combine the teachings of the Medicine Wheel and the gentle, reflective nature of horses for an experiential journey toward wholeness. The Medicine Wheel, Sacred Hoop, or Mandala is an ancient symbol used by many indigenous cultures that provides a framework for understanding ourselves within the Cycles of Life. Horses offer the deepening and understanding of these cycles, leading us toward greater self-awareness and authentic self-expression. In society today many suffer from feeling separate, lonely, and disconnected. The medicine wheel paradigm of our ancestors was the ability to connect the dots in life’s journey – understanding and learning from our interconnection to every other living thing, including horses. Horses provide a powerful opening for humans to feel connected. Their highly developed sensory intelligence can awaken what lies dormant, what truth wants to be revealed, and what is ready to be awakened at the right time within the human spirit. 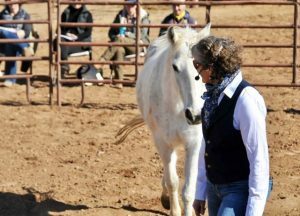 With Horse as guide and teacher, participants will identify a dream, desire, or goal they would like to realize or gain more awareness and clarity with, enter the sacred hoop/round pen with Horse, and allow what wants to emerge to become awake. Laurie Higgins-Kerley’s enthusiasm for explorations into “the mystery of all life” is infectious. Her training includes Native American Medicine Wheel teachings and techniques, Shamanic healing ways and ceremonies, energetic chakra clearing through Pleiadian Lightwork, and Kundalini Yoga Teacher Training. She has facilitated, hosted, and led workshops on Medicine Wheel teachings, drummings and ceremonies. 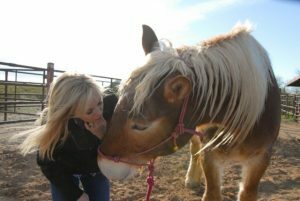 Laurie founded the non-profit organization, Dove Creek Equine Rescue in 2012 and has been Executive Director of it since. Horses are rescued, rehabilitated, retrained, and rehomed. 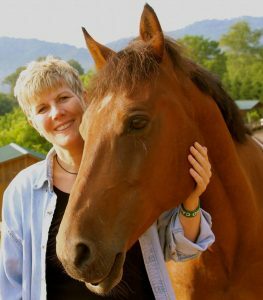 Because of her experiences there, Laurie wanted to create a program focusing on the healing partnership between horses and humans. 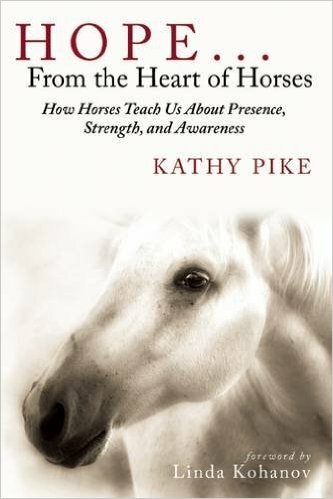 So, she graduated from Kathy Pike’s Coaching with Horses certification program in April 2017 and joyfully integrates her path to wholeness with this powerful heart centered approach; exploring the authentic expression and inner wisdom within each one of us who walk this walk with her. Presented by: Carole Rodon, Ph.D. Native Americans used paints, feathers, beads, and their hair to connect and intertwine their intentions and spirits with their horses and Horse Ancestors to prepare for war, games, the hunt, and ceremonies of celebration. During this session, learn to emulate these ancient practices to experience spiritual gifts and a deeper relationship while honoring Horse. By first finding inner stillness, and entering into horse-time, you ask for guidance. You then trust that guidance and give yourself permission to explore it through creative expression with your horse partner – painting, braiding, beading – to decorate with awareness and without expectations, judgment, or self-doubt. 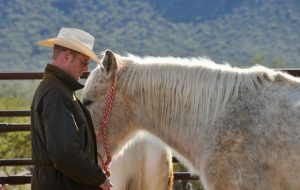 The guidance may be a message sensed from your horse through his or her body language and communication or through ideas, emotions, sensations, colors, or images. The guidance may also feel ephemeral, as if emanating from the land itself and the entire herd of horses within our shared energy field. 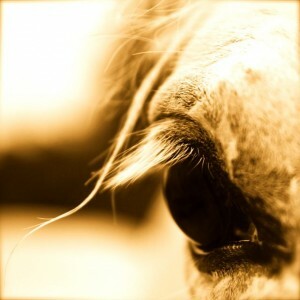 Experience a still point within your self as you connect deeply, finding sacredness with the soul of your horse. Discover inner messages, learn the form in which they naturally emerge, and the fruitful ways they can guide your outer actions. Carole Rodon earned her Ph.D. in Counseling Psychology from the University of Missouri in Columbia and BS in Occupational Therapy from the University of Wisconsin in Madison. She retired in 2017 after 27 years as a psychologist in private practice and 17 years as an occupational therapist. In 2014, she graduated from The Academy for Coaching with Horses, completing her certification in Equine Facilitated Learning and Coaching. She currently presents EFLC workshops with colleagues, facilitates individual and group EFLC sessions, helps with Academy for Coaching with Horses trainings, and supports research studying the effects on horses of horse-human interactions. Carol enjoys a variety of artistic expression including painting, pastels, handcrafts, and writing poetry. She lives in Columbia, MO with her two-legged and four-legged family. Humans rely on their minds and speaking as primary ways of being in the world. Horses gather and sense information through their whole bodies, picking up energy from one another and other beings around them. As herd animals and highly vibrational, sensing beings, horses process all energy as information, without judgment or labeling. What a horse senses as energy, humans process as emotions, though we tend to place judgment and labels on those emotions as good, bad, helpful, a hindrance, etc. Spending time in the presence of horses, by being mindful and present in the moment, can open your awareness and your information-gathering capacity in new and deeper ways. In this exploration, you will experience being more horse-like, strengthening your intuition and inner wisdom by practicing body-centered awareness and ways of receiving information while in the presence of horses. Your intuition may be strongest through sight, hearing, smell, feeling, or simply by just knowing something. Find a more integrated sense of yourself to access information, and become more whole, mindful, and as fully present as horses are. Jackie Hibbard is an Ordained Minister in the United Church of Christ (UCC) and has worked in Volunteer Management at several non-profit organizations. Jackie holds an undergraduate degree in education and has taught workshops in volunteer management both to the community and at the college level. She also served for several years as Adjunct Professor in Field Education at Iliff School of Theology. In 2005, Jackie moved into hospice chaplaincy and then into hospice leadership positions. Currently, she is Team Leader for Halcyon Hospice and volunteers at Community UCC in Boulder where she helps lead contemplative Taize services. The phrase “herd mentality” is almost always used in the negative sense, often associated with mindlessness and frequently linked to the worst of human behaviors. Yet, animals, fish, and insects rely on a herd, a swarm, a flock, or a school for decision-making and safety. As we learn more about these behaviors and attributes in nature, we as a society are daily arriving at a new and positive application of this concept in the form of Artificial Swarm Intelligence (ASI). ASI is what scientists ascribe to human communities when they attempt to replicate the multi-component, decentralized, or emergent intelligence often exhibited in bees, ants, flocking birds, and horse herds. During this interactive session with a herd of horses, you will learn what it means to experience decentralized intelligence and to play in very horse-like ways with the energy fields that are present and active in both the humans and the horses. Participants will be able to differentiate between ASI and “crowd-sourcing,” and will be introduced to the critical components of constructing and functioning within an ASI. This exploration of hive or herd intelligence will stretch your ability to shift and improve your communication and collaboration style, along with deepening your understanding of the importance of diversity within groups. You will interact with the horses and with each other to expand your capacities and harness your energy for the greater good of both the human and the horse herd. Todd Butler and his family raise heritage breeds of both livestock and vegetables on their farm in South Central Michigan. His mustang, Dublin, can be found roaming those acres as well. Todd brings a wealth of experience as a professor of theology, and now serves as the Dean of Arts & Sciences at Jackson College. He regularly preaches, leads retreats and facilitates workshops nationally, including sharing his nationally recognized work with incarcerated men at the annual American Correctional Association; as retreat leader for the national convening of the Oblates of St. Francis DeSales, an order of priests and brothers; and has delivered addresses to educational and civic leaders in both Brazil and China. Dean Butler holds a Master’s in Education from Bowling Green State University, a Master’s of Divinity from St. John’s University, and a doctorate in Homiletics from Aquinas Institute of Theology. 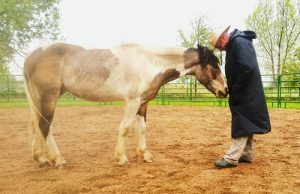 Todd earned his certification in Equine Facilitated Learning and Coaching from Kathy Pike in May of 2016 and immediately incorporated EFLC into his work with men. Horses are composed of 60% muscle. To function effectively, a muscle must be able to contract and release, with its fibers gliding and folding over one another. When muscle tissue becomes tight due to toxins or injury, it is then deprived of oxygen. This condition results in the muscle becoming knotted, painful, damaged, and spasmodic. Rubbing aches and pains is a natural and instinctive response. People verbalize their need to seek a massage. Horses will also communicate their discomfort through subtle or noticeable changes in their body movement, mood, and behavior. 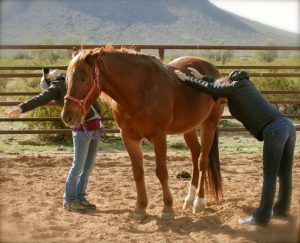 During this hands-on equine massage session, you will experience introductory techniques, knowledge, and tools to provide muscle relaxation and balance. When your hands connect with the horse, the horse’s body intuitively knows where to apply the energetic healing within the muscles. You will gain sensory awareness from the horses from the feedback they provide. Equine massage assists in healing your horses; it also develops a deeper heart-felt connection on several levels. An increased emotional, mental, and spiritual wellness bond is experienced through this type of horse and human interaction. 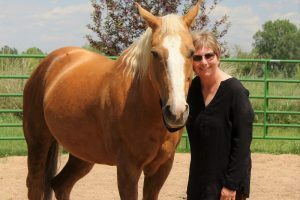 Maggie Wilkins-Klammer is a BScN, RN of 45 years, and a Certified Practitioner in Equine Massage, Reflexology, Reiki, and Reconnective Healing. She was born and raised a Park Warden’s daughter in the backcountry of Jasper National Park, Alberta, Canada. During the many years of taking guests into the mountain backcountry on Horseback Vacations, she witnessed stress related to the busyness of life diminished as the guests shifted into the energetic healing rhythms nature and horse offered. 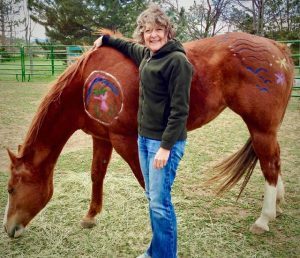 Maggie’s lifelong passion for horses, nature, and healing was the beginning of her journey to create a Healing Sanctuary with Nature and Horses so she could share this remarkable energy with others. She graduated in 2014 from The Academy for Coaching with Horses. Maggie, with her husband Jerry, operate their Four Point Healing With Horse business at their Ranch in Alberta, Canada. Have you ever visited a herd of horses in the middle of the night, with the weight of their sleepy presence dropping you deeper into your own body awareness? Have you ever joined a quiet herd of horses standing still under a shade tree on a hot summer’s day, finding yourself moving from that busy brain state into an altered sense of time and reality? Have you ever sat in the presence of a herd, with the intention to release the busy beta brain activity that typically governs all humans, allowing yourself to explore the more expansive and creative realms of the slower brain waves that move you from surviving to thriving? Join Kathy Pike as she teaches you how to move beyond the common, mundane physical world you are accustom to, and shift your mind and body into an altered state of consciousness that removes all resistance and opens up possibilities. This state of consciousness that Kathy calls “The Acoustical State of Being” brings you closely, if not fully into, how to be “horse-like” in an ever-changing, high-speed human world. Supported by the quiet, reflective and restful elder herd at the ranch, the power of the collective herd supports you in making this significant and powerful shift of consciousness. Have you ever watched a person move with grace and ease accompanied by a beautiful and willing equine partner? Have you longed to have that same experience with your own horse? There is a place we can go with Horse, where such ease, connection and grace can move us deeply. When we find this special place in space all time stands still and something beyond us moves through us. It is a sacred connection between two beings of different worlds, meeting in a space of oneness. Our body begins to move and horse follows along, we separate and come back to connect, eyes become bright and curious and hearts open with possibility. This is the dance of Horse. Open your eyes and your heart and know that you can find this place not only with your herd, but also in all of your life. Dancing with Horse is a journey beyond horse training or technique where we meet Horse in his or her world, in the greater Horse Consciousness. During this two part learning session Kathy will demonstrate some of the key ways to prepare and communicate with your horse for dancing. She will give you tips on how to also prepare yourself and begin this highly experiential and creative process with Horse. One of the best things we can do for our relationship with self, others and with horses is to have aliveness and vitality in our body. Through activating the chakras and bringing more rejuvenation into the human system you are more centered, aware, and sensitive to your own needs and those of others. Join us in the morning for a lovely blend of Polarity Yoga, stretching, movement and flow to shake up your chakras and get your vital life force energy moving, followed by a relaxing meditation and visualization. Debbie Dietrich is a lifelong rider and horse lover. She is currently a riding instructor at Hidden View Stables in Crownsville, MD and a 2017 graduate of Kathy Pike’s Yearlong EFLC Certification Program and has continued to assist with programs. 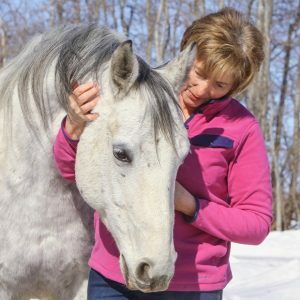 As a riding instructor, Debbie is integrating key elements of EFLC into her riding lessons and offers separate EFLC coaching sessions to a variety of clients. 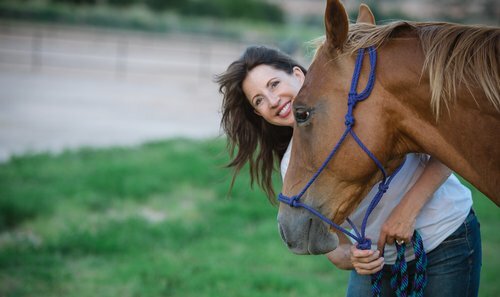 Debbie is a firm believer in the power of horses to teach us all how to live a more balanced and authentic life. 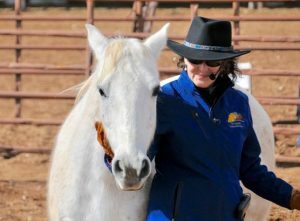 Debbie is passionate about supporting people in reaching higher levels of connection and communication with horses. 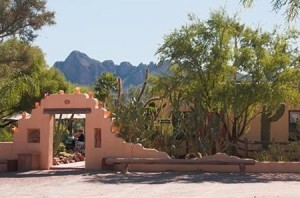 White Stallion Ranch, Tucson, Arizona (shuttles are available from and to the airport for only $25 each way so no rental car is needed). The true value of this Retreat and Conference is priceless. For monetary purposes and to support the growth of this new field of exploring consciousness with Horse, we have set a value at $1270. $870 per person when you book before January 15, 2018. Your accommodations and meals are separate of the Retreat and Conference tuition. The White Stallion Ranch offers a lodging package that includes: program time, morning ride, food, lodging, amenities, gratuities, and taxes. There is a shuttle available to and from the lodge so you do not have to rent a car (for only $25 each way). IMPORTANT: You must stay at the lodge to attend the Retreat and Conference and you must book both the event and your room at the ranch at the same time. You register for the Conference and Retreat on this page, and call the White Stallion Ranch separately to book your room. We have reserved 40 rooms and they will fill quickly. 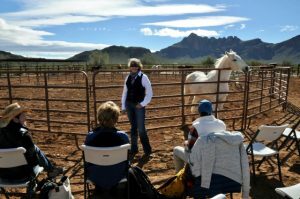 To reserve your room call the White Stallion Ranch directly at 520-297-0252 and say you’re a participant of the Kathy Pike Retreat and Conference. Cornelia Roulet is the photographer for this event. We would like to thank her for many of the beautiful photos on this page. The 2018 gathering of humans and horses was spectacular! Equine Facilitated Learning, also called Equine Assisted Learning, is a rapidly growing field. This conference provides a variety of learning opportunities with a high level of hands on experience. “Thank you and your team again for organizing the beautiful conference in many ways. This program is highly recommended for anyone considering entering the field of Equine Facilitated Learning.